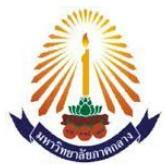 The University of Central Thailand is educational opportunities in higher education of young people in central and northern parts. And to lighten the load. Management services. Higher Education of the educators of the province of 2 persons is required in Central College is a private university under the direction and supervision of the Commission on Higher Education. To lighten the burden of tertiary education and no problems at school graduate. Secondary and vocational levels. To raise the education level of people in central and north on the rise. The high production efficiency. To be a major force in local development and growth continue to benefit the nation. To a high professional education. A research study. Promoting and providing technical values. A good ethics. To provide students with knowledge and ability to apply knowledge, skills and experience used to live there. The performance. Taught how to coordinate with the economy and culture of the region. Focus on financial subjects. Foreign trade as well. Arts and culture. And practical. Research and technical services to promote personal development outcomes. Maintain public art and culture of the Thai nation. Licensee and the founder of a school career. In education since the year 2508. With resolute determination to carry the university into an institution of educational experience. There are sufficient funds in the administration of a smooth transition and growth. With 200 acres of land waste. Makes it possible to extend the study to no end. The expected dividend income.